Yesterday EV and I visited The Academy of Natural Sciences for the first time together! A T-Rex skull, as shot by EV! Despite Philly’s bevy of museums, The Academy has always been a sentimental favorite of mine due to its dinosaurs. 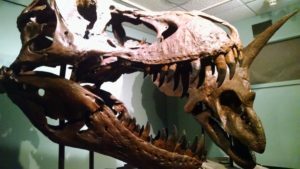 As an adult, I realize that it represents much more than that as our city’s Science Museum, but as a kid I was less focused on the “science” part and moreso on the part where I could stand next to a full-size T-Rex skeleton. I still get a special thrill every time I visit, although in recent years that been only for trips to the Philly Geek Awards. The current special exhibit at the museum is called “Dinosaurs Unearthed,” and it gave me one of my first “kids these days!” shaking-of-old-man-cane experiences directly related to parenting EV (because, as they relate to kids in general, I’ve been having those moments since I was six). That’s because this exhibit presents about a half-dozen animatronic dinosaurs at actual scale, and in some cases kids can direct their sounds and movements via a console of light-up buttons. 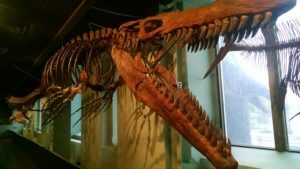 As an adult whose love for the museum is rooted in seeing fossils, I wasn’t enamored with this brief experience fill with lights and motion. Granted, it was packed with educational content – with more placards to read to EV than appeared with the displays in the rest of the museum. Despite that, I couldn’t help feeling that it was more of a theme park feature than a museum exhibit. Maybe that’s because as an adult I don’t need to see moving dinosaurs to pique my interest in the creatures – I would have probably been more interested in information about the science of how the animalectronics were built! 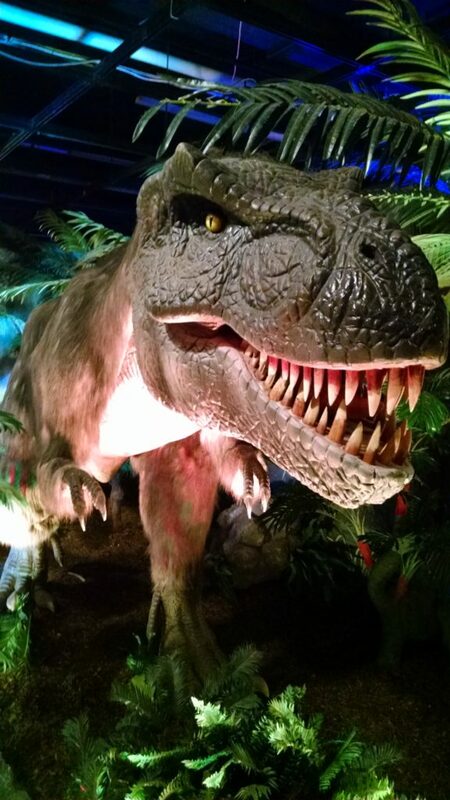 A more lifelike adolescent T-Rex, which EV was not eager to spend too much time standing in front of. Yet, I can’t deny the allure for younger kids who aren’t old enough to appreciate the magnitude of seeing casts of million-year-old bones. Maybe this is just anecdotal, but Unearthed seemed to trend pretty heavily towards toddlers through first or second graders compared to the rest of the museum. Yesterday also marked a week of living in a world of Pokémon Go. Visiting the Academy also gave me a chance to experience the phenomenon in the city and oh my glam the urban play environment is a totally difference from our barren suburbia (or, apparently, from black neighborhoods, which are measurably underrepresented when it comes to gyms and PokeStops). I first opened the game during one of EV’s intense dino-button-pushing sessions in the special exhibit (yes, I appreciate the irony) to discover that the Benjamin Franklin Parkway was exploding in a rainbow of gyms and lured PokeStops. While I didn’t want to spend our time in the museum catching creatures, I was interested to see how many people were doing so given articles about how the National Holocaust Museum was pleading with visitors to refrain from playing out of respect. While there were a few other parents idly playing while kids interacted with exhibits, I never saw a critical mass of gamers. Maybe that’s more about the age-range of kids at this museum or its content. It was when we stepped out onto the street that the app exploded into constant vibrations signaling new encounters. I could barely make it a half block without the chance to capture another critter. We were absolutely besieged with them when we stopped for lunch at Mama’s Vegetarian (another EV first!) and a treat at Shake Shack. We eventually made it down to Rittenhouse Square, and it was there that I finally experienced Pokémon Go as a social phenomenon. The park was teeming with obvious trainers orbiting a lured stop in the middle of the park. It was so visible that I felt the need to finally clue EV in to what I have been doing on my phone all week by way of explanation. When EV and I stopped to catch a Horsea in one of the fountains (our first water creature! ), folks started chatting us up about where we typically hunt and what sort of creatures we find there. Despite the allure of digital monsters in the park, I was charmed when EV tugged on my sleeve and demanded not to catch another Pokémon, but to return to The Academy of Natural Sciences to push a few more dinosaur buttons despite being visibly exhausted and in need of a nap. I’m not usually one to accede to every toddler demand, but that was one I was very happy to fulfill.